The Epiphone Wildkat is a true original, the first new archtop design of the modern era and a certified classic. Now for a limited time go Wild again with the Epiphone Ltd. Ed. 2014 Wildkat in Wine Red. Epiphone has been a leader in archtop design since the 1930s and was one the first guitar manufactures to recognize that archtop fans needed pickups in their guitars to be heard on bigger stages and in raucous honky tonks. Throughout the 50s and 60s, Epiphone refined the archtop further with classics like the Riviera, the Sheraton, and the Casino. The Ltd. Ed. 2014 Wildkat’s innovative design has the same classic profile of those vintage Epiphone archtops but made smaller for easier travel. The Wildkat features a solid Mahogany body that is computer-routed to create a perfectly tuned acoustic guitar-like body but with a “center block” just like Sheraton II or ES-335. The combination gives the Wildkat that round “archtop” tone with the incredible sustain of a solid body guitar. 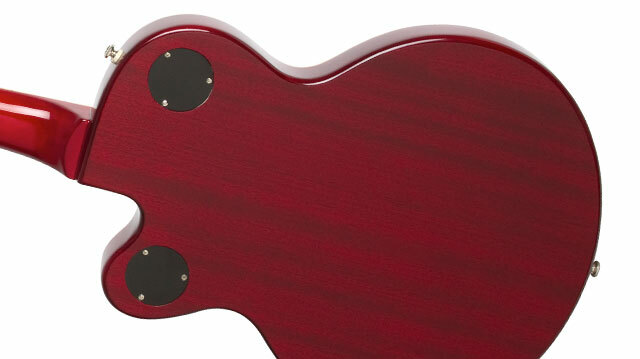 The Wildkat’s top is made from laminated Flame Maple with a stunning Wine Red finish for a semi-hollow body masterpiece you can only get from Epiphone. The Epiphone Ltd. Ed. Wildkat in Wine Red is backed by Epiphone’s Limited Lifetime Warranty, which also features Gibson 24/7/365 Customer Service and guarantees the instrument against defects in materials or workmanship. Visit your Authorized Epiphone Dealer and check out the best kept secret in guitars, the Ltd. Ed. 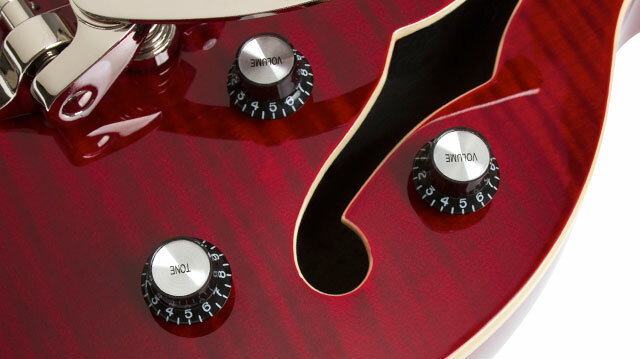 2014 Wildkat in Wine Red. The Wildkat’s Mahogany body is matched with a hand-fitted, glued-in solid Hard Maple neck for maximum tone and sustain. The neck has dot inlays, a 24.75” scale, and Epiphone’s fan-favorite SlimTaperTM profile that’s easy on the hands for long hours of performing and rehearsing. The classic fingerboard has a 12” radius and a standard 1.68” nut. The Ltd. Ed. Wildkat’s headstock features Epiphone’s early 60’s “bullet” badge, seen on rare models from the early 60s including the very first Casino in 1961. The Ltd. Ed. Wildkat also comes with world famous Grover® machine heads with an 18:1 ratio for fast and accurate tuning. The Wildkat not only brought a new look to modern archtops but it also re-introduced Epiphone P-90 pickups to a new generation. P-90s are one of the most versatile single coil pickups in the world. A favorite of pop, rock, jazz, and rockabilly players, P-90s have powered classics by The Beatles, Oasis, and GRAMMYTM winner Gary Clark Jr. The Ltd. Ed. Wildkat in Wine Red features a P-90R Dogear Classic in the rhythm position and a slightly hotter P-90T Dogear Classic in the lead position. The pickups are powered by a master volume control, individual volume controls, and a master tone control with standard-equipped 500K potentiometers and “Top Hat” knobs. 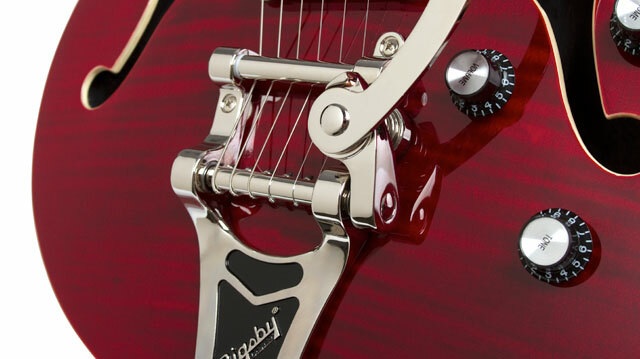 The Wildkat also breaks new ground by offering players an authentic B70 licensed Bigsby® vibrato along with Epiphone’s renown LockTone™ Tune-o-matic bridge, a heavy duty output jack, and Epiphone’s all metal 3-way toggle switch.